I’am certainly not an expert on dry, itchy scalps. But I have found a solution that works. The change in weather in the last couple of weeks has wreaked havoc with my scalp. It was flaky and itchy, very itchy. TMI? Which is something I’m all too familiar with. And having a dry, itchy scalp can be really embarrassing, but rest assured it is very common. Now, there are lots of causes of a dry itchy scalp such as; excessive anxiety, stress, dandruff, poor hair care, change of hair products, product buildup, not drying your hair thoroughly and changes in temperature, or season, like in this case. In hope to soothe my scalp I had bought a couple of products, such as anti-dandruff shampoo and Boots Expert Dry Scalp shampoo and nothing helped. It is worth mentioning that if over the counter/at home remedies aren’t working, or your scalp is inflamed, oozing, cracking or bleeding consult your GP. Now, DIY beauty has never really been my thing, just a thing of Pinterest. But having learnt (after a little of online reading) that a simple dry scalp requires nothing more than moisturising, a mixture of natural oils seemed like a good solution. 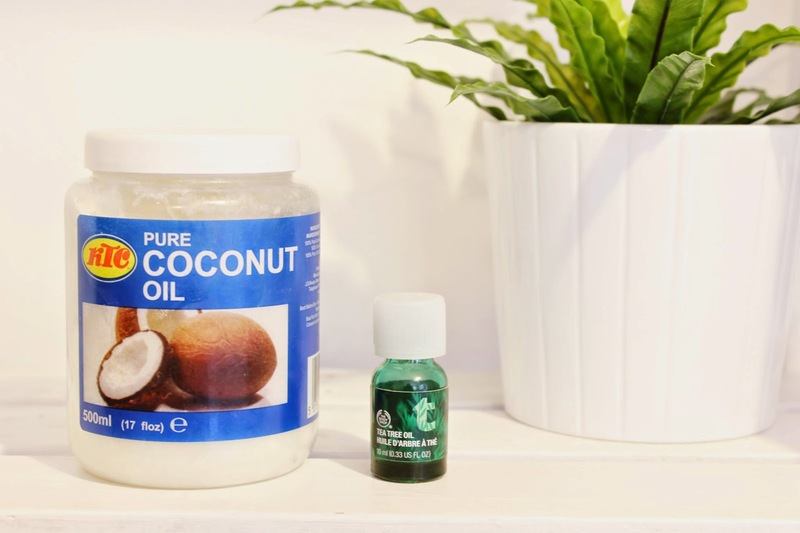 As a dry scalp is generally down to the lack of moisture in your hair follicles, coconut oil works wonders as it super moisturising and acts as a treatment to restore moisture, it also helps soothe the scalp and creates a barrier to keep the skin moisturised. Tea tree oil on the other hand, has powerful natural anti-fungal, anti-inflammatory and antibacterial properties. That kills the bacteria causing the over production of skin cells which create dandruff. And together coconut oil and tea tree oil make the perfect dry, itchy scalp saviour. All you need to do is take the coconut oil and mix it with the tea tree oil. Coconut oil is solid and liquifies when warmed. I personally like to mix the products together using the back of a spoon and then I will take then solid(ish) coconut oil and massage it into my scalp and during this process it will melt. I spend a few minutes massaging the scalp and then leave the treatment for as long as possible. And after a couple of hours, I wash out the oils using my regular shampoo (make sure you rinse your hair well, otherwise you’ll be left with super greasy hair) and then dry my hair thoroughly.